Our Director's telling of the long journey Rim to Rim in the Grand Canyon. Living in an Orange Toxic Waste Dump! It is often said about young people that they are unpredictable. It can be summed up in the popular tune, "What is the matter with kids today?" For centuries, older folks have cast a worried and weary eye on the next generation often with good cause. It can also be said that young people can have an incredible heroic idealism that can be contagious. I remember a few years back we had a volunteer group of Civil Air Patrol youth visit our Reservation. These were a tougher blue collar type of youngster from the east coast. Most of them were from very modest homes, and had little or nothing in the way of money or possessions. These youth were doing some odd jobs like home repair and painting out in a tiny hamlet outside of Many Farms. It was muddy, with dirt and clay around one of the Hogans in a small cluster of homes at the home site where the young people were working. Each day the group would unload their trucks supervised by adults who were officers and mentor sat the work site. There was only one little patch of pavement. It was about 20 feet long and maybe 3 feet wide. There was a little girl from this one room Hogan. She was perhaps 3 years old. During the day she would come out of the Hogan that did not have electricity or running water, and watch the young people work. She had an old tricycle that had broken spokes and bent wheels. She would drag that tricycle around the dirt lot, pushing and pulling it along the patch of pavement as if she was riding the tricycle, even though she could not. At the end of the week, the group of youth grabbed me. They were so very excited. They told me they had something they wanted to show me. I watched as they pulled a covered object off the back of the truck with smiling faces from ear to ear. They made me close my eyes as they unveiled the mystery object. When I opened my eyes, I was stunned to see a sparkling new trimmed out little girls tricycle. They told me how last night they were sitting around the camp site talking about the little girl at Many Farms who had been dragging around her broken tricycle. They decided to pool their nickels, quarters and dollars together and give up their own pocket money to buy that little girl a new trike. I was astounded and deeply moved. I could not have been more proud of them, and I told them so. They had come out to one of the most remote parts of the reservation to do charitable work. They had saved the best for last. I am confident they took something even more valuable home with them it is true that it is better to give than to receive, and they had also taught me an important lesson. Young people can be moved to acts of mercy, heroism and charity. We have a new project for our youngsters that we are planning and designing. We are trying to pool together our nickels, quarters, and dollars. It's going to be a new skate park. This park is going to be a safe and well supervised park. The City officials are helping us, and the local police departments will pass numerous times a day in what will be a well lit and open area. We have the land already, which is good. I know skate boarding is sometimes associated with negative elements. In our area where there is almost no recreation or facilities, and little for our young people to do, this would be a monumental addition. 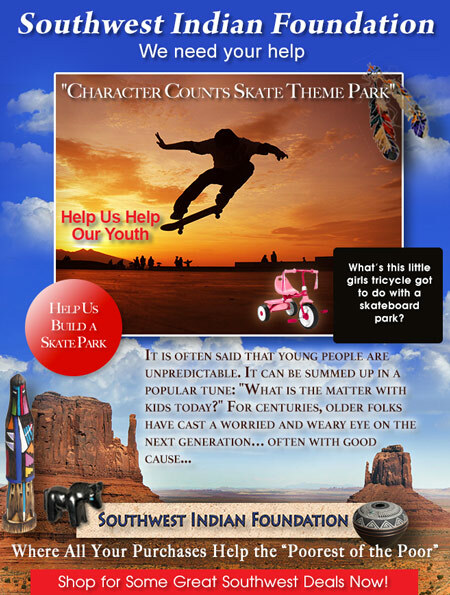 We are going to call the new park the "Character Counts Skate Theme Park". Lined around the park will be pictorial art of great men and women of inspiration and quotes of their pearls of wisdom. This will add beauty as well as a providing a teaching tool to the surrounding environment. This will be a family atmosphere. We are in the early stages, but there isa building excitement and good will. Many of our young people want to help in any way they can to make this a reality. There is an ancient Native proverb: Young people are like wax. Early on you can grab, form and mould them. When they reach a certain advanced age, they harden and turn to steel. From that point on, what form is left will be their character make up. In my heart of hearts, I am convinced that our young people can be formed to do great and positive things. Where they can soar like eagles! They just need a little guidance and a helping hand. We sure could use some help with this project. You have always been so good to us, and we never can properly thank or repay you. 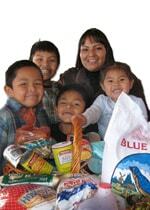 Visit Our Southwest Indian Foundation Donation Page. It will do your heart good.